Yes, finally, finally, finally, October 2018 will see a new edition of 1001 Books You Must Read Before You Die. As usual, Arukiyomi will be updating the 1001 Books App for iPhone and the 1001 Books Excel Spreadsheet for fans of the list. You can expect those out at the same time as the new edition is published, give or take any intervention by the deity I serve. 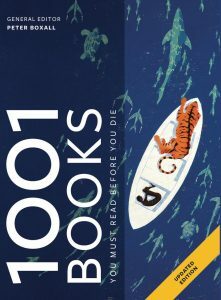 Judging from the cover, is this the first time that one title has appeared both on the 1001 Books cover and the 1001 Movies cover? I think it is. For movie fans, the 1001 Movies list will also see a new edition (as usual). The app and spreadsheet will also be updated for that too. I can’t find the book for sale in the U.S. have you seen it yet? Hi Diane. This edition of the book won’t be available for sale in the US. It’s a UK edition. If you want it, you’ll have to order it from the UK and have it shipped to the US.